Beamr Optimizer reduces bitrate without compromising quality, enabling the delivery of a smoother streaming experience with faster stream starts and less re-buffering events. Beamr Optimizer increases the reach of 4K UHD video delivery to a wider audience, enabling better monetization and ROI for the expensive 4K content production, across all devices. Beamr Optimizer cuts video bitrate by up to 50%, enabling significant savings in content delivery network (CDN) costs, as well as lowering overall storage expenses. Beamr Optimizer is the only video optimizer that guarantees an always safe optimization process, ensuring the preservation of subjective quality when reducing video bitrates, by verifying the quality of each video frame in a closed loop. Beamr Optimizer outputs fully standard-compliant H.264 and HEVC files, allowing users to watch videos on any standard media player and across all their devices, without downloading additional client-side software or plug-ins. Beamr Optimizer optimizes video streams automatically, delivering a scalable solution that does not require any manual intervention, since videos are automatically analyzed and optimized to the lowest bitrate possible without compromising perceptual quality. 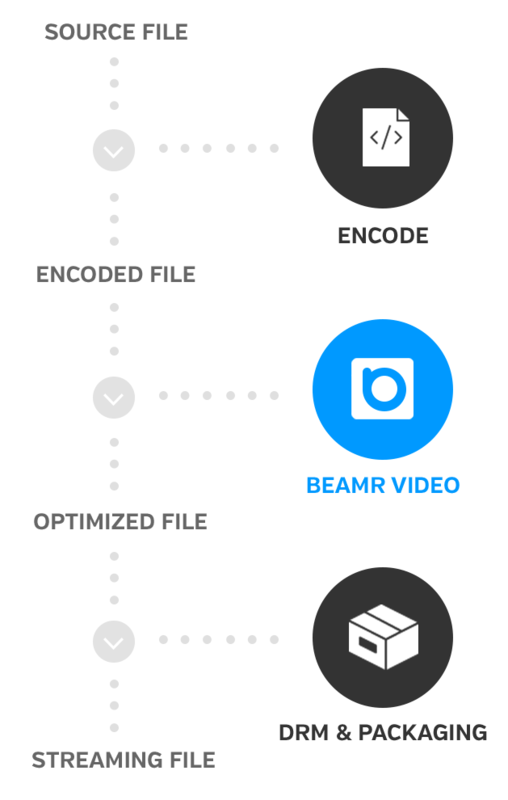 Beamr Optimizer is integrated into an existing video processing workflow after the encoding stage, and before the packaging and DRM stage. The initial encode is required to provide a quality reference to Beamr Optimizer, which preserves the quality of the encoded file while reducing its bitrate as much as possible. CLICK to learn more about with Beamr’s video codecs. Beamr Optimizer works seamlessly even with Adaptive Bitrate (ABR) streams, ensuring they remain aligned after optimization. CLICK to learn more about Beamr perceptual optimization technology. This step is performed on the optimized file in exactly the same way as it would have been performed for the regular encoded file. Offered in various deployment models, Beamr Optimizer delivers a smoother streaming experience with faster stream start and reduced buffering, resulting in increased ARPU, reduced distribution costs and above all higher customer satisfaction. Learn how you can adopt perceptual optimization into your workflow. Beamr is a technology innovator in HEVC and H.264 video technologies. Hollywood studios, MSO’s and some of the world’s largest OTT streaming services use Beamr’s content adaptive technology to guarantee the highest video quality at the lowest bitrates.